One of the many presents I received for Christmas (you can see my posts here and here) was this little gadget. 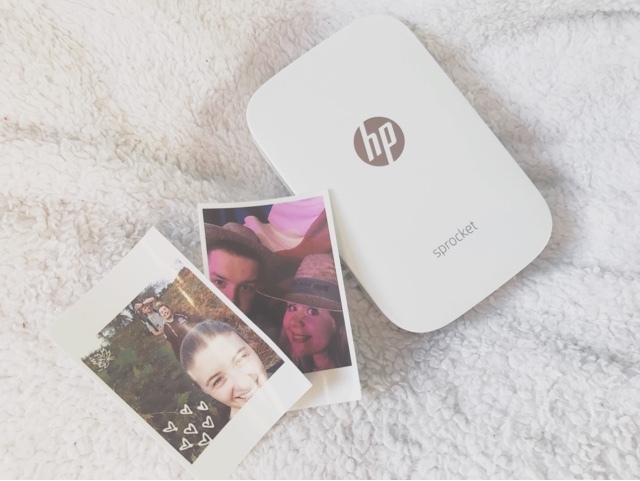 The HP Sprocket was hyped just before Christmas when Zoella talked about it on her channel. I'd also seen several other bloggers mention it or feature it on their insta's! I quickly added it my list and luckily my boyfriend picked this up in the Black Friday sale. Basically this little piece of equipment is a hand held printer for photos. It prints pictures from your phone/iPad/tablet in minutes. All you need is a photo, printer paper (£10 for 20 sheets) and a device that can connect via Bluetooth. Firstly, load the paper, it comes with clear instructions so you can't mess up, and then download the Sprocket app. Join your phone and the HP Sprocket via bluetooth and then turn it on. Open the app and find the picture you want to print. Here you can edit the picture, add frames and decorate it with stickers or whatever you want. Simply click the print button and viola, job done! Don't be worried if your first picture prints out blank, it has to get rid of the first sheet of printer paper. Simply just print your wanted picture again. The Sprocket is not only handy and extremely clever (hello, where is the ink!?) but it also looks beautiful. HP have really got it right with the sleek white and copper design, it's a bloggers dream right? It instantly looks recognisable and looks beautiful on the old 'gram. As you can see from the pictures, I love the Polaroid style frame - it looks so classic and old school. I'm currently thinking (stalking Pinterest) of ways to display my photos so if you have any ideas please let me know. My vote is currently going to string and pegs against my white wall! I'm desperate to get my hands on one of these little gadgets, they're just so cool - perfect for scrapbooking!